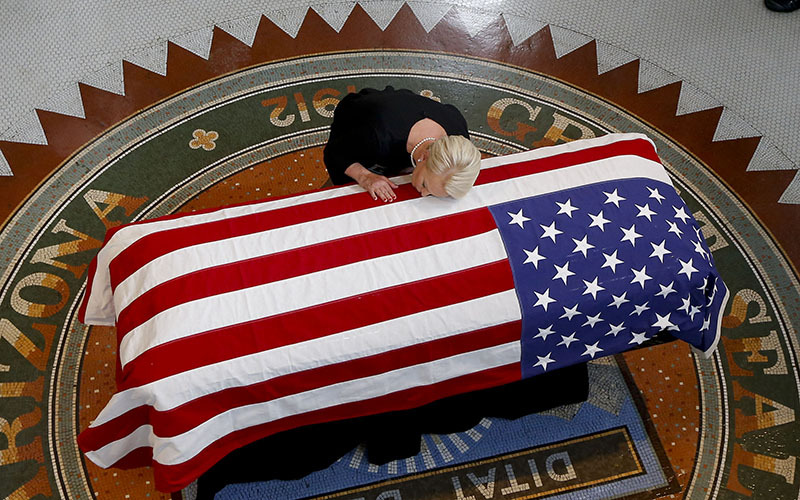 PHOENIX – On Wednesday, Arizonans said their last goodbyes to Sen. John McCain, who died Saturday after a battle with brain cancer. Thousands streamed into the state Capitol rotunda to view McCain’s flag-draped casket. John Goodie, 66, a Mesa High School football coach, remembers meeting John McCain in 1996 after McCain spoke at the school for the Young Republicans club. McCain asked the school’s administrators on to meet Goodie, who was a security guard at the time, to thank him for his efforts to make Martin Luther King Jr. day a holiday in Mesa. Even though they didn’t agree politically, Goodie said that McCain appreciated his work. They later talked about football and campus security. Goodie said he was honored to be at the memorial service and pray for McCain. An estimated 1,500 people waited in line, which stretched from the Capitol to the intersection of 16th Avenue and Jefferson Street by 2 p.m. Mourners endured a sun-drenched sky, with high temperatures expected to top out at 105 degrees. While the line inched forward, a large screen at 17th Avenue and Jefferson showed a livestream of the casket as Arizona residents streamed past. WATCH: Cronkite Noticias explains Sen. John McCain’s relationship with the Latin community. Cmdr. Andrew Williamson has served in the Coast Guard for 23 years, in the Gulf of Mexico and the Pacific Northwest. His career might never have occurred if not for McCain, he said. The encounter had a great impact on Williamson. Earl McElroy said he will always remember the integrity of McCain’s response to a woman at a town hall in 2008 who called McCain’s presidential opponent, Barack Obama, an Arab. He wants other politicians to show that sense of honor. “I wish other elected officials would, too, but they’re just so afraid,” McElroy said. 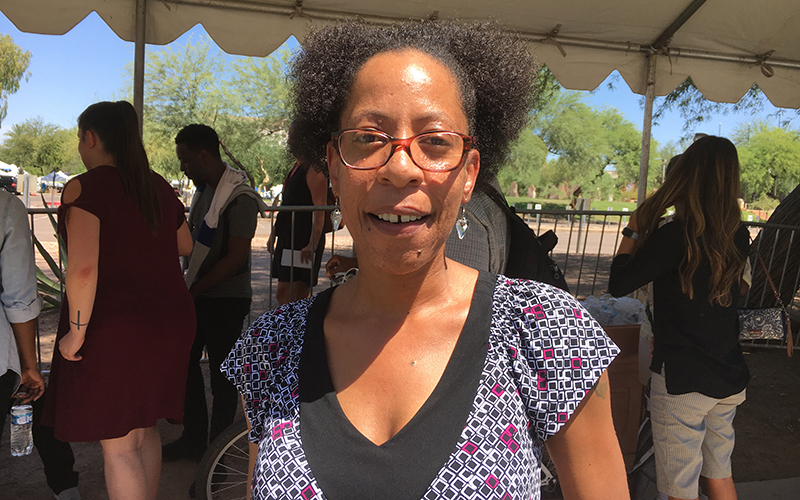 Chasity Pullin, who was born and raised in Phoenix, took time off from work to honor the six-term senator and former presidential candidate. Pullin hopes others will follow his example by not only speaking up about what they believe in, but also acting to support these beliefs. 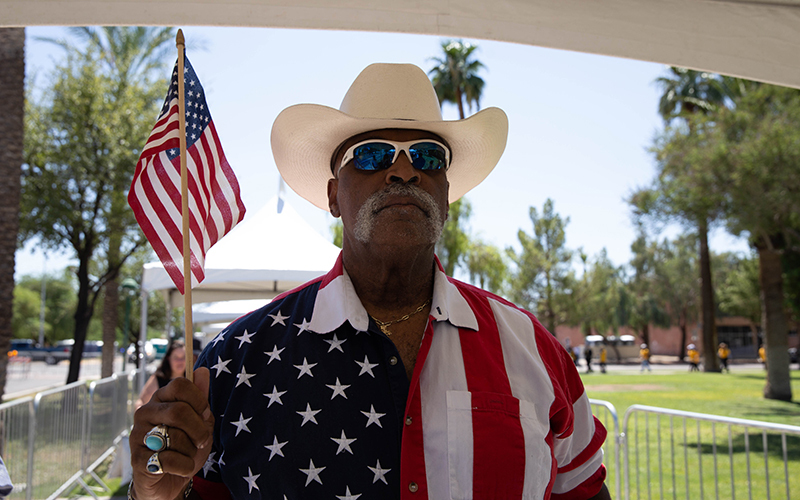 Joe Meo, 66, of Mesa, remembers an experience he and his wife, Kathy, had with McCain while waiting for a shuttle to the Arizona State Fairgrounds. Susan Moore, 69, drove from Tucson to see McCain’s casket lie in state. Moore, who considers McCain her hero, said she admired how McCain always tried to do the right thing, even when that meant going against the Republican Party. She wants other politicians to follow McCain’s example. She wrote a letter she hopes to place near his casket. “I have my truth, you have your truth, but John McCain spoke the truth,” Moore said. Some people lined up as early as 7 a.m.; the doors to the rotunda opened earlier than scheduled, at 1 p.m.
Arizona Sen. Jeff Flake, a friend and Republican colleague of McCain, said today is a day of mourning for the entire state but also a day of celebration for a life well-lived. Patriot Guard Riders conducted a flag salute Monday morning at the Capitol while waiting for McCain’s motorcade. The salute included a prayer and playing the national anthem before the group lined 17th Avenue with flags. The salute was not a part of the official motorcade, which brought McCain’s body from the funeral home to the Capitol. The nonprofit group was there at the request of McCain’s family. 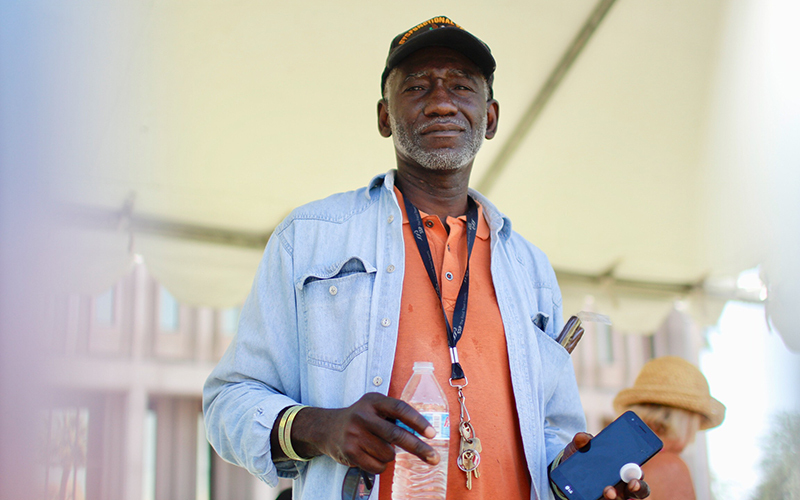 “We’re here for anyone that has served our nation,” Campbell said. Veterans groups were a large presence among the mourners. Others veterans said they also felt a close connection to the six-term Republican senator. Cronkite News reporters Stephanie Morse, Jordan Dafnis, Chris McCrory, Sam Ficarro, Adriana Falero, Jimmie Jackson contributed to this article.